Were you one of those kids who always tried to fit the proverbial square peg into the round hole? Well fear not! Bloxorz provides you the satisfaction of trying to get the square peg into the square hole. As always, there are a few caveats. You move the square peg with your arrow keys and the block moves end-over-end as you gleefully navigate the levels you are created. The goal is to stand the block up so that it falls into the hole and thus, completes the level. 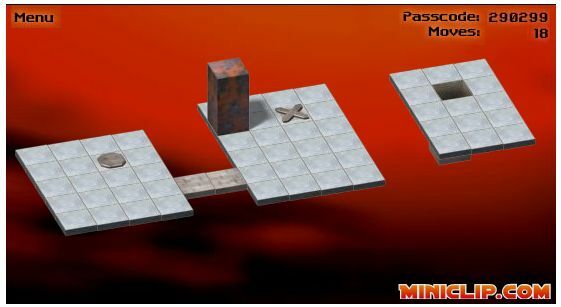 There are various switches that manipulate the level, and if any part of the block falls off the board the whole thing goes to hell and you have to start the level from scratch. This game involves a fair grasp of spacial perception and if you are one of those people who instantly grasped the concept of parallel parking you stand to do fairly well. If not, well, don’t you think it’s time to learn to parallel park? I mean really, people. Enjoy the blocky goodness and here’s hoping this week’s offering doesn’t infuriate my fellow sidewhites blogger quite as much as last week’s. just thought you should know that walter is now addicted to online gaming. you’ve created a monster!